Optically, these scopes deliver unparalleled image quality. Vortex's proprietary ALO, automated laser optical, alignment process forges a new paradigm in the sport optics industry, resulting in the most forgiving, comfortable, and highest quality images possible. The APO objective lens system uses index-matched lenses to correct color across the entire visual spectrum. HD premium extra-low dispersion glass delivers the ultimate in resolution and color fidelity, resulting in High Definition images. XR Plus premium fully multi-coated lenses increase light transmission for optimum brightness. ArmorTek protects exterior lenses from scratches, oil and dirt. ✔ ALO Alignment - Proprietary, precision-laser process, perfectly aligns every lens element to ensure the absolute best image possible. ✔ APO System - Index-matched lenses correct color across the entire visual spectrum. ✔ Optically Indexed Lenses - Optimize image sharpness and brightness from edge to edge. ✔ HD Lens Elements - Optical system comprised of premium components and optimized optical design, delivers outstanding resolution, color fidelity, edge-to-edge sharpness, and light transmission - resulting in High Definition views. AMG lenses are ground, polished, and coated in the USA. ✔ XR Plus Fully Multi-Coated - Ultimate anti-reflective coatings on all air-to-glass surfaces provide maximum light transmission for peak clarity and the pinnacle of low-light performance. ✔ Plasma Tech - Cutting edge coating application process provides unparalleled coating durability and performance. ✔ First Focal Plane Reticle - Scale of reticle remains in proportion to the zoomed image. Constant subtensions allow accurate holdover and ranging at all magnifications. ✔ Glass-etched Reticle - Allows for intricate reticle design. Protected between two layers of glass for optimum durability and reliability. ✔ Illuminated Reticle - Provides precise aiming under low-light conditions. ✔ Made in the USA - Every component, from the Type III hard-anodized body, turrets, mag ring and eyepiece, to the smallest screw-even the index-matched lenses are made in America. ✔ Tube Size - 30 mm diameter provides maximized internal adjustment and strength. ✔ Single-Piece Tube - Maximizes alignment for improved accuracy and optimum visual performance, as well as ensures strength and waterproofness. ✔ Aircraft-Grade Aluminum - Constructed from a solid block of aircraft-grade aluminum for strength and rigidity. ✔ Waterproof - O-ring seals prevent moisture, dust and debris from penetrating the riflescope for reliable performance in all environments. ✔ Fogproof - Argon gas purging prevents internal fogging over a wide range of temperatures. ✔ Shockproof - Rugged construction withstands recoil and impact. ✔ Hard Anodized Black Finish - Highly durable Type III hard-coat anodization provides a low-glare matte surface and helps camouflage the shooter's position. ✔ ArmorTek - Ultra-hard exterior lens coatings defend against scratches, oil, and dirt. ✔ L-Tec Turrets - Integrated locking mechanism prevents accidental adjustments. Turrets provide fast, accurate, easily read elevation and windage adjustments. Patent pending. ✔ Locking Illumination - Locks illumination at preferred setting. ✔ Side Focus - Adjustment located on left side of turret housing is easily accessible from shooting position. Provides optimal image focus and parallax removal. ✔ Maximized Turret Zero Adjustment - Turret design allows expanded adjustment range when L-Tec zero stop feature is disengaged for zeroing purposes. 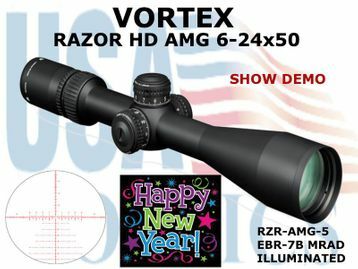 This scope offers 27.5 MRAD total elevation adjustment and 19 MRAD total windage adjustment. ✔ Micro Adjust Zero Setting - Infinite zero setting positions allow zero to be set between clicks for optimal accuracy. ✔ Turret Screws - Provides low-friction, wear-resistant performance: precision-machined from a silicon-brass alloy and treated with an advanced dry-film lubricant. Turret screw threads are precision machined to sub-2 micron tolerances (less than 78-millionths of an inch). Ultra-smooth operation and adjustments. ✔ Erector Tube System - Precision-machined from aircraft grade aluminum with anti-galling properties for a lighter weight, strong, durable tube. Stainless Steel offset coil spring erector biasing system withstands much higher stresses than traditional flat erector springs and allows much more internal elevation and windage travel with better freedom of movement for ultimate turret precision. ✔ Locking Diopter Eyepiece - This feature allows the shooter to set and lock the eyepiece setting once for their eye and forget it. ✔ L-Tec Tool - Included with your scope for precise adjustments to the turret. EBR-7B RETICLE (MRAD)-The EBR-7B (Enhanced Battle Reticle) is a hashmarked ranging reticle using mrad based subtension lines for ranging, holdover, and windage corrections.